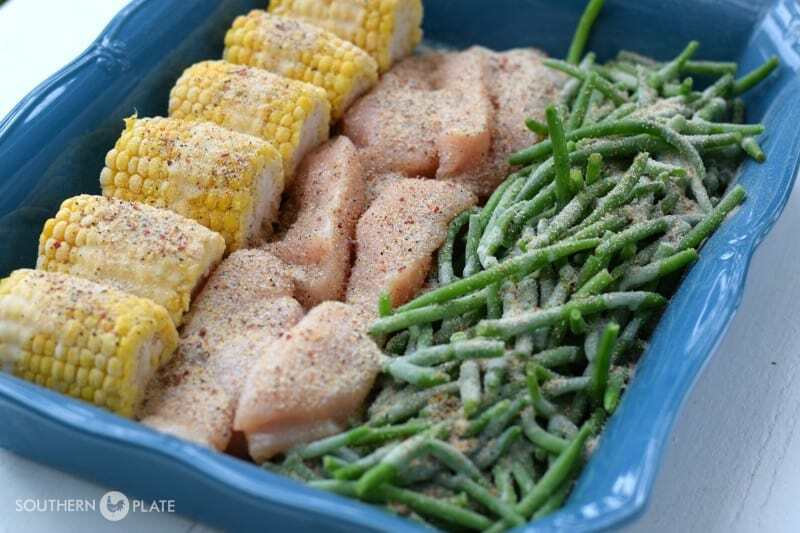 Dinner In A Dish – The Perfect Supper When You’re Too Tired To Cook! Low Carb Notes: Make this dish low carb by substituting a low carb veggie for the corn. Suggestions are: cauliflower asparagus, brussels sprouts, broccoli, etc. No matter what type of work we do. We all have days where we find ourselves just too tired to cook. This recipe is going to be your best friend on those days. An entree and two sides cook happily together, perfectly seasoned in a zesty butter sauce. When the four of us have this for supper, there is even enough for folks to come back for seconds of their favorite parts. My Katy always wants more corn and I absolutely cannot stop eating these green beans because they are just so good, so delicious, so perfect. 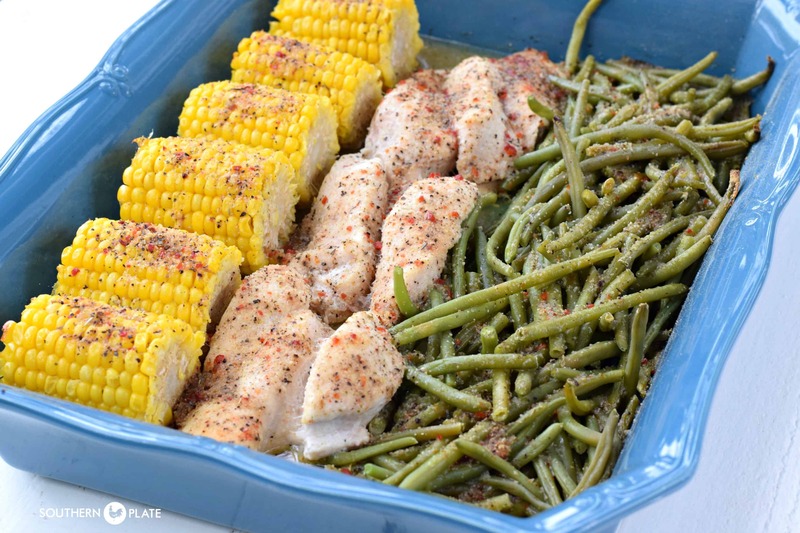 To make this, you’ll need: boneless skinless chicken breasts**, frozen corn on the cob, frozen whole green beans*, zesty Italian dressing mix, and butter. 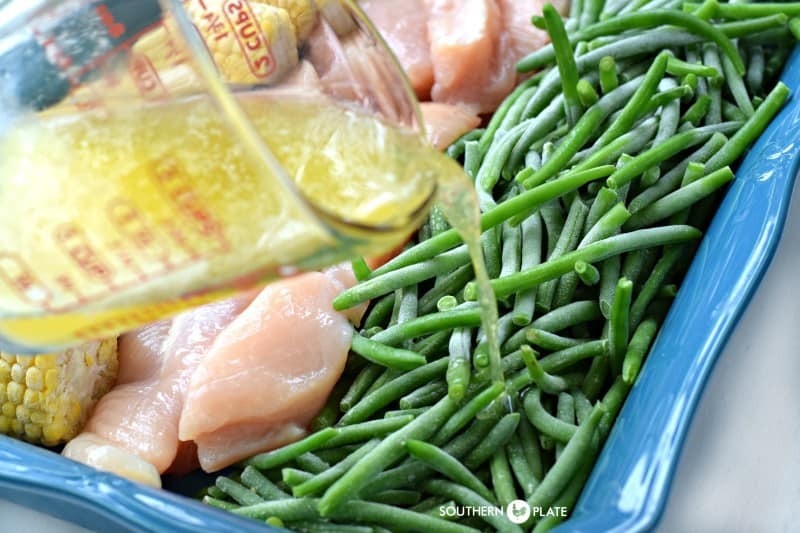 *You can use canned green beans for this but frozen are the next best thing to fresh and I love the texture and flavor of them so much more than canned. You can also use fresh, of course! No changes are needed if you use either of these substitutions. **Yes, you can use chicken that has already been cut into tenders. I usually have boneless, skinless breasts on hand so I just cut each one of those into two or three strips and I’m good to go. Note: To make this low carb, use one pack of dressing mix and omit the corn. Begin by arranging all of this in a large 9×13 baking dish. Arranging it is the fussiest part of the recipe so that’s pretty good, huh? 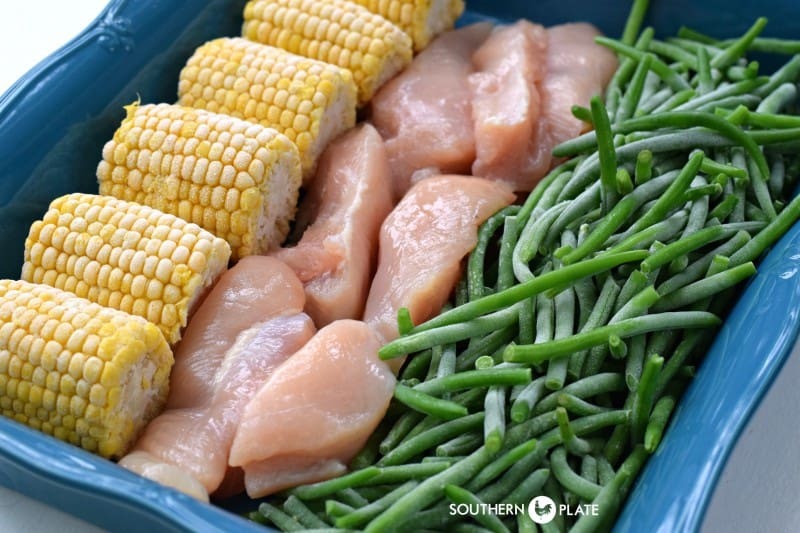 I line my corn up first, then place my chicken in the dish, and then pour the green beans along the side. Note: We are not thawing anything first. You are welcome to if you’d like or if it makes your day a little brighter for whatever reason. We all have our things and I’m not gonna judge ;). Melt your butter and pour it over everything in the dish. I actually have a “melt butter” setting on my Advantium oven, which is pretty cool. Now take those two packets of zesty Italian seasoning and sprinkle over the whole thing. Get ready to dive into a mouthwatering supper! 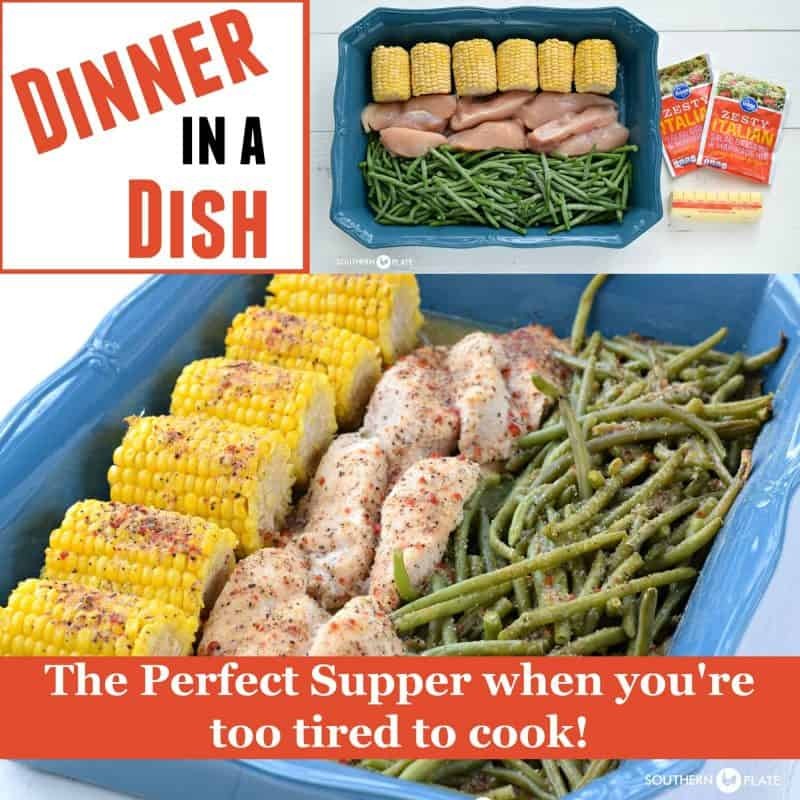 This meal in one is perfect for those nights when you're just too tired to cook! No one would guess this is a shortcut by the taste, though! Arrange ears of corn going down the length of a 9x13 pan (see photo in post). Place chicken strips down center of pan. Pour green beans along other side. Pour melted butter over all. Sprinkle evenly with Italian dressing mix. 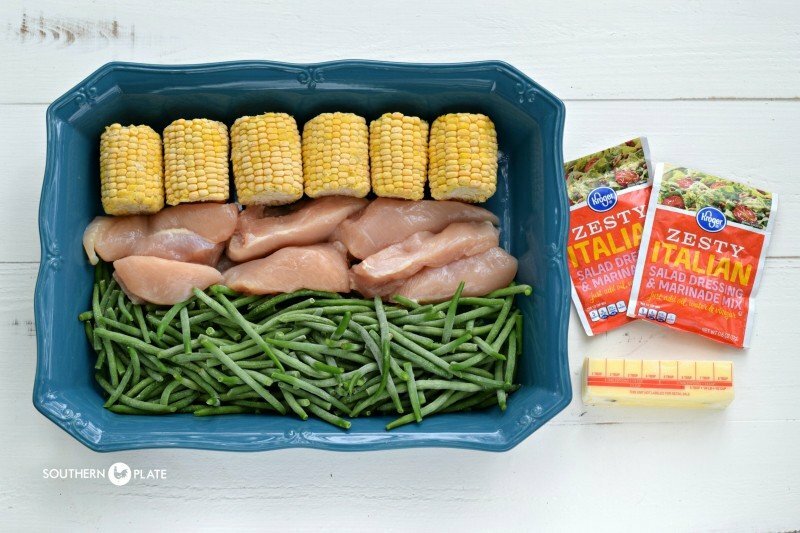 Wrap in foil and bake at 350 for one hour, or until chicken is cooked through and corn is hot. I hope you’re having a lovely day wherever you are in the world right now. It’s sunny and warm (actually hot) in Alabama and outside my window there is green for as far as the eye can see. My heart is happy and at home here. I couldn’t ask for more. I know we all have busy schedules and sometimes the weight of demands placed on us seems unbearable, but if you can – take just a moment to step outside, wherever you are, and just look up. I try to do this a few times a day. It is a treat, a serenity therapy of sorts. Stepping outside and being surrounded by nature (or sometimes skyscrapers) reminds us how small we are and helps large problems shrink in comparison. Now take a deep breath. Close your eyes and feel the sun on your face, and exhale. You’re gonna be alright. God’s got this. This recipe has been shared on the Weekend Potluck at The Country Cook! Love, love, love the look of this dish. And, awesome words of inspiration. I do that myself sometimes, just look up into the sky and thank God for whatever I can think of to thank him for. Even if it’s just for the sun or the wind or the pretty day. Thanks for all the nice words of encouragement Christy. And, by the way, in watching the video you posted yesterday, you look great. Keep up the good work!!! I love to use potatoes instead of corn on the cob. Just peel and cube. They are awesome in this! I turned it up to 400 seems it was taking a little longer is that okay? I was thinking that and have some reds to try it out tomorrow! Love this Christy…, Sandra, and Dawn! A big hug and “thank you” for this recipe. I was just wondering about what to make for dinner tonight and the Lord heard that desire. hehe ♥♥ We all have heavy demands and burdens but there is ALWAYS and thank you to be had in our day. Thank you, Christy, for your thoughtfulness and blessings! What a great idea for dinner. Thank you for your words of wisdom. They always brighten my day and cause me to stop and give thanks for how blessed we are. You are a great role model for so many . Thank you again! I always look forward to your posts! I have made many dishes from your recipes and we have loved them all. Your Christian quotes are so inspiring!!! Thanks for making some days a little brighter for so many!! Would it be possible to use fresh corn? I just had to say, this brightened up my whole day & got me back on the right track. You are a special lady, Christy…so pleased and honoured to have found you on Pintrest. I haven’t but you certainly could!! Seeing a comment above, could I use corn and potatoes instead of green beans? The husband is NOT a fan of green beans. Or what other bean might substitute? Can’t wait for fresh corn to appear at the roadside stands – will try making it this way soon! What are the “crave” baked beans? Did I miss this? This looks delicious! Thanks for sharing and for your wonderful comments in the end. Just what I needed today! I didn’t know you could put raw chicken next to other ingredients. I have always cooked chicken separate and poured the liquid off or used as broth in something else. good to know…. Looks yummy and definitely easy to do. Just wondering about the caloric and fat content. Hey DJ! There are apps and websites online where you can enter the recipe and find out. I’m afraid I just don’t have the time to do that for all of my recipes – and sure enough if I tried I’d miscalculate and that would cause a whole other set of problems :). I think Myfitnesspal.com has the option and it’s free. I’m actually eating Keto, which is low carb high fat, and this dish is excellent – provided I skip the corn. 🙂 Hope you get to try it soon! I am a member of SparkPeople.com 🙂 It’s a great community/food diary/recipe “breaker-downer” and a great place to find healthy recipes. You can also log fitness info and work out with free fitness videos. Check it out! Do you think it would be OK to use asparagus in the place of the green beans??? My family doesn’t like green beans. This is a perfect meal for those busy days! Thank you! I have been making this dish for years! Our family loves it. It’s also a really good dish to take to Church dinners. When taking to Church, I use a larger casserole dish and add potatoes (cut into bite size pieces). I’ve even substituted dry Ranch dressing mix which was also a hit! Thanks Christy for sharing such wonderful recipes and great stories! Isn’t it great how versatile this dish is? So glad you love it as much as we do!! Looks yummy! Can anyone think of a low-carb veggie that would go well with this other than corn? I’m not sure what would go well with Italian seasoning…. Thank you! I double the green beans because they are SO GOOD in this that I can’t stop eating them. You could also sub cauliflower, broccoli, asparagus, Brussels sprouts, etc. Hope you get to try it soon! Hi Katrina, I am sorry I didn’t see this until now but was out of town with my family. It packaged Italian dressing is different and won’t be the same. I haven’t tried using the pre-made and it may work but you would have a good bit of excess liquid. If you tried it I would love to hear how it turned out. That all in one recipe sounds good. More than that, I really needed to hear the encouragement in the last two lines. It brought tears to my eyes. Thank you. Have a blessed evening. ~HUGS~ I hope you have a blessed week Emily!! Is the chicken frozen too? The chicken was just refrigerated. If you can, thaw that first as it is just more tender that way. If you can’t, I would add as much as thirty minutes to the bake time. That looks sooo good and is sooo simple!! I love dishes like that! Substituting items will also allow you to do it another day soon! Love ya and hope to mess you again soon! It is a great recipe that can be easily changed up Mary Sue!! Love you too, have a blessed week! Love the recipe!!!! When I went to our Walmart today I looked for your Southern Plate Dinners in the magazine section but could not find it. Would sure love to get my hands on a copy. Have a great week! Hey Beulah, if you can’t find it in a store locally you can order it online. I hope you have a great and blessed week!! Your dish sounds very easy and good. I, too am having trouble finding “suppers”. 🙂 I hope you enjoy it Linda!! Another good recipe that I need to try Christy and I want to say that I love your recipes and always refer to them over any other cookbooks. Your recipes and tips are delicious but also practical for everybody; not like all the chefs that try to use so many different and unusual ingredients that you will never use again and that exhaust me just trying to read through them! Most of us do our own cooking and can’t afford a private chef anyway. Good ole southern cooking! Oh my goodness, thank you so much Elna!! I agree, if a recipe is too fussy to even read through, who would make it? I truly appreciate your recipes that I consider ‘meals in the bank’ and this definitely qualifies because I always have these ingredients on hand and never thought to cook them in this clever way!! I love these kind of meals as well Shelzp!! I hope you enjoy this one!! Thank you for this idea! Being alone I like to fix meals for a family meal and then divide it into single portions to freeze for those days I don’t feel like cooking. Cooking for one is not always easy. Hey Robert! It’s always a treat to see you. I wish your day was a little easier, I know those can be pretty tough. Hang in there and maybe it will pass quickly. Have a great evening, regardless. You deserve some kick back time! I hope you enjoyed it Robert!! Glad to see you survived Jury Duty! Could this be made with chicken legs? My store the legs on sale and I bought a couple backs. Want to make this for supper. This is a dish I am going to put on the menu and make next week. Christy, I don’t tell you often enough how I enjoy your stories and comments and always get something out of them. Thank you so much. Oh my goodness, thank you so much!! I hope you enjoy this great dish and thanks again for making my day! Before God was a mention in my heart other than what my grandmother’s provided, being raised on a farm, this was a form of entertainment in the late afternoon hours – looking up in the sky and being transfixed by the clouds and their forms. Now that God is my heart I look up and see this and see more than the beautiful blue sky and delicate clouds but see His majestic wonder and know that all is well in my world, because all this is His. Yep – look up, look up …… God’s got this, believe it. Can you cook this recipe in a crockpot? It is too hot to use my oven. I haven’t tried cooking it in a slow cooker but I can’t see why it wouldn’t work. If you try it I would layer it and put the green beans on top. I made this last night. Thank you so much for such a time-saving recipe! However, I changed the ingredients drastically, and used the stove-top instead of the oven… I maintained the corn (in one corner of the pot), then in the other corner layered pork chops, potatoes and carrots, all cut into large chunks. Topped it with wild mushroom and fresh green pepper.